Adams Morgan is Washington DC's most cosmopolitan neighborhood. It received its name when in 1954 the Supreme Court ordered desegregation of schools, and the principals of the John Quincy Adams school (white), and Thomas Morgan school (African American) got together to have joint projects promoting better race relations. 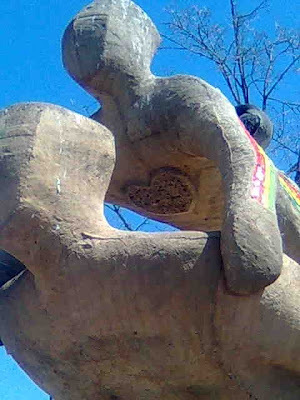 On a tour of Adams Morgan today I crossed Unity Park, where a local flea market and ethnic foods were being sold all around this sculpture of a father carrying his son on his back. This one heart on the child's chest reaches out to many different ethnic groups below, promoting unity in diversity.